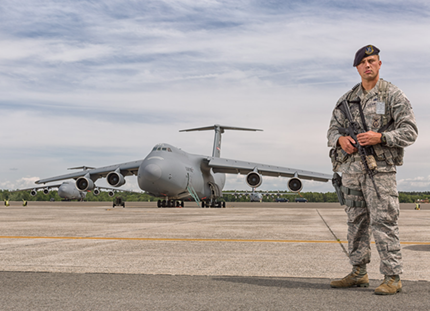 Overview: Military police in the Air Force Reserve are called Security Forces Specialists. With job tasks ranging from writing traffic tickets to dealing with situations requiring deadly force, these highly trained specialists must possess a variety of skills and be adaptable to all circumstances. Their ability to communicate must be equal to their investigative, weapons and physical capabilities. Within three years prior to entry into military service, have not been terminated from civilian employment more than twice for reasons of misconduct, theft, or alcohol use. No history of mood disorders including bipolar disorder, major depression, dysthymia, or depression not otherwise specified. No recorded evidence of personality disorder, sustained or untreatable emotional instability to include depression, or suicidal behavior to include attempts, gestures, ideations, threats or history of self-mutilation. Never convicted by a civilian court of a Category 1, 2 or 3 offense, nor exceeded the accepted number of Category 4 offenses. Category 3 and 4 traffic offenses alone are not disqualifying. Must possess a valid state driver’s license to operate government motor vehicles.